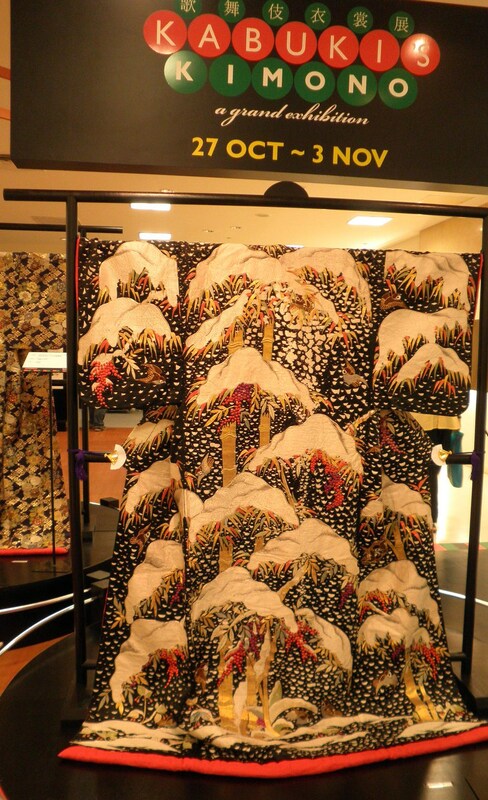 Today we happened upon an amazing display of 22 exquisite Japanese kimonos, each one a work of art. 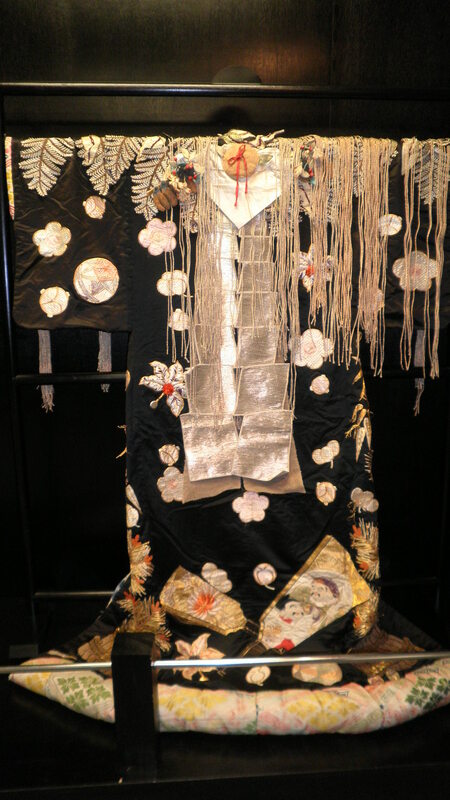 Worn by the Kabuki actors during the early days, these unique kimonos have been preserved by the costumer for the Kabuki stage from 1907 to 1952. 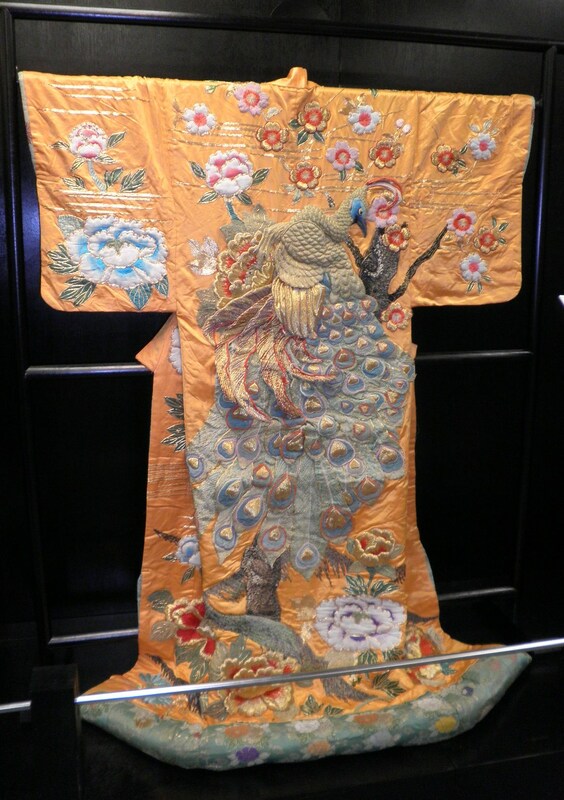 Kabuki, literally means Music (ka), Dance (bu) and Play (ki) and it has many fascinating aspects but what fascinates the audience most has been the actor’s flashy kimono and make-up. This traditional form of Japanese theatre dates back to the sixteenth century when a dancing girl known as “Okuni of Izumo” began performing in the river beds of Kyoto. Kabuki plays are about historical events, moral conflicts and of course, love relationships. It is really lovely to live in a country were you come across displays such as this in a department store in a mall. Being a teacher is not for the fainthearted. The hours can be incredibly long, the stress crushing, the endless marking mind-numbing. But every once in while you get a little encouragement. I got this a couple of months ago, and thought I would post it. I hope its author, now at the University of Toronto, won’t mind. I’m leaving for Canada tomorrow, the first of September. 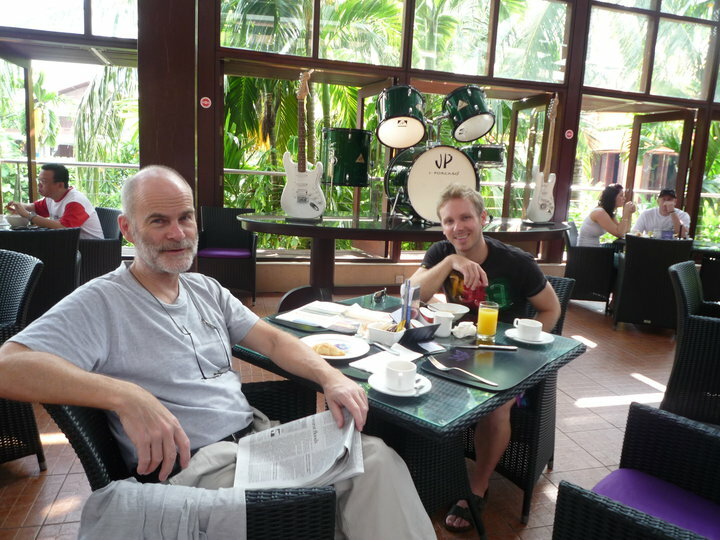 Before departing, I’d like to take the opportunity to thank you for everything you have given me. By everything, I mean your guidance, support, dedication and inspiration. Thank you for guiding me in class, showing me how to behave as a student and a proper citizen of the world, being useful and helpful to society; putting others before myself. It is one of the most useful things that you have equipped me with. Thank you for your support. I remember the times when you were willing to use up some of your time to spend with me, in hope that I am able to produce a piece of work that lives up to your standard. Yes, you may say that it is part of your duty as a teacher, but because you do it with so much passion and dedication, the support I’ve received from you means so much more. Thank you for being my inspiration. Your commitment to Christ through serving the community in Cambodia along with your wife, is an inspiration to me. I strive to become like you, always willing to serve Christ, and do whatever it takes to be His salt and light. I thank God for bringing you into my life, as it has given me the motivation and impacted me to serve Him well. Sir, THANK YOU. I wish you all the best in all that you do, be it your career, your relationships with family and friends, as well as your health. I hope to meet you in the future, hoping to make you proud. Every road that’s begun has an ending. Every season has its share of pain. We only get love through our giving. In each loss there is something to gain. And lie with each compromised breath. With only the wealth of their souls. And offer my life back to Him. And walk down the straight narrow road. And treasure the life He’s bestowed. I was chatting to a younger colleague in our new favourite place, an uptairs cafe that makes me a soy latte just the way I like it and plays nice, easy jazz. He was complaining that now that he is thirty he can’t do the things he used to take for granted and he wondered what it was like for an old geezer like me. He was much kinder than that, but that’s the gist of it. I told him that there are lot of things that I can’t do anymore, but it doesn’t pay to dwell on them. Instead just do the things you can do. Happiness does not consist in not having things that you would like to have, but in liking the things you do have. In other words, being satisfied with what you’ve got. I am a very fortunate man, and I have a lot. Most of it has taken a great deal of hard work not just to get, but to keep. Some of it – like my salvation – has been totally undeserved grace on the part of Christ Jesus the Lord God of All. I did nothing but accept His offer. Along the way I have taken my share of abuse, from both enemies and friends, and had my share of disappointments and heartaches. I have done some things right, and I have made some mistakes. Nobody gets out of this life unscathed. But as I enter into my old age – and sixty, while it may not be old, is the beginning of that phase – I’ve got to say that I am pretty comfortable with who I am and where I am in life. It not so much that I have done this or that, but that I have, in all that I have done, sought to live up to, at first, my own standards of what was decent, fair and honourable, and later in life, please God, who is the ultimate authority on those things. I will not leave this life with many toys. So if that is your measure, then I obviously lose. But I am not going to bring those things with me anyway. All that I get to take is my character. I figure if I live long enough for Christ to have His way with me, then that will be worth taking. The Moral Values workshop that we spent so much time praying and planning for is now over and it is impossible for me to put my feelings into words. 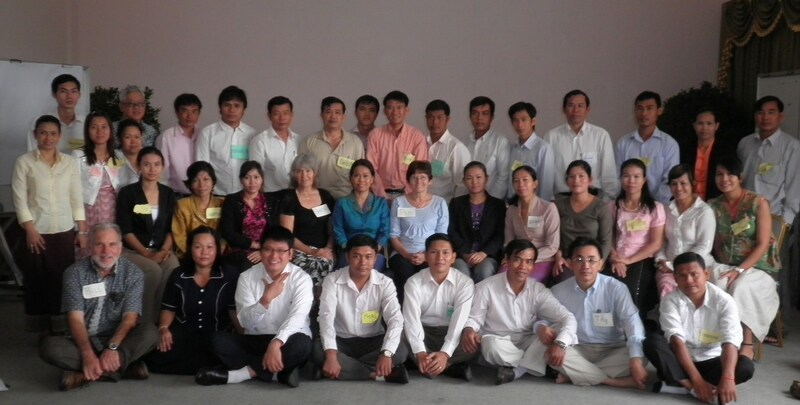 We started out the week getting to know a lovely group of very well educated and committed Cambodians. 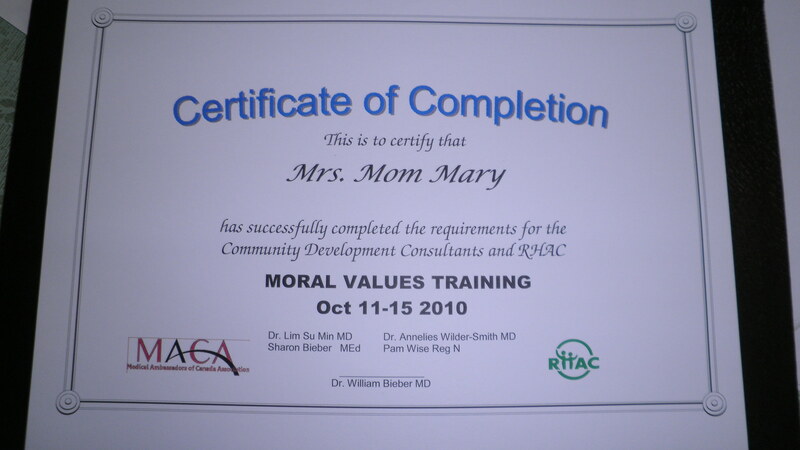 Their hope was that their minds would be opened up to the impact that moral values have on the health of individuals, families and their country. Throughout the week we used the illustrations of a dying “Tree of Despair” with evil roots and a flourishing “Tree of Hope” with roots of strong moral values. We stressed the need to dig out these sick roots and plant strong roots of right living and good moral values. Initially their concerns were all about the corruption, poverty, loss of family and cultural values, and their inability to address the despair that they and their families live with. With each new lesson, we saw the excitement grow and the vocabulary change. Rapidly they went from describing the family as a rigid structure with room for nothing but meeting physical needs to an understanding that the home needs to be a place where children learn about love, kindness, respect, forgiveness, faithfulness, responsibility and can develop a strong sense of self and the ability to resist temptation. Another recurring theme was the process of character development: knowing what is good, desiring what is good, and practicing the good until finally it becomes a habit. Each lesson began with a role play or story, which everyone loved, followed by a set of questions designed to draw out the principles of the lesson. Joseph was such a big hit that Bill had to revise a lesson so that he could finish the story the following day. Small group discussions were then used to bring out the desired understanding and the learners really enjoyed this participatory approach and the respect for their own knowledge. They told us that these words were not new to them. They had heard them all before, but just had no idea what they meant or how to apply them. 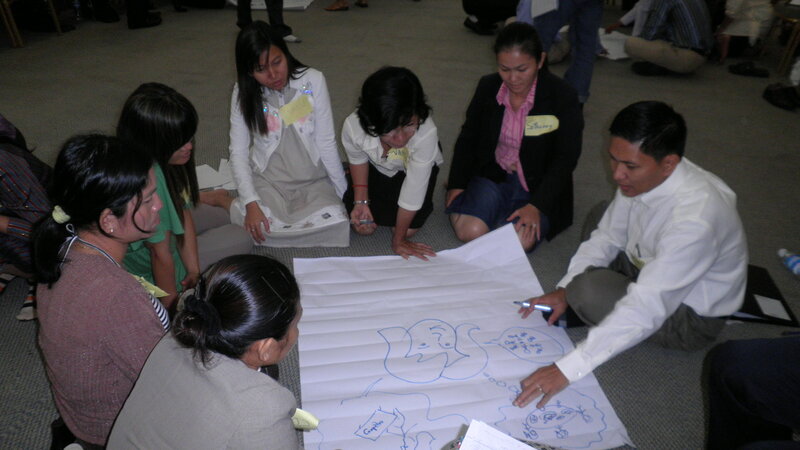 Some of the concepts really challenged the way the Cambodian society functions. In one session we used the story of the woman caught in adultery and created a real stir when we suggested that the man involved may have in some way been at fault. The concept that children are entitled to be respected by adults was also pretty new. At the end of each session the participants wrote a personal application in a journal- one thing that they intended to change in their own life or family. During the wrap up session the Executive Director challenged the staff to apply this to their own lives, begin to spread it to others in the workplace and integrate these lessons into the training for Volunteers and Peer Educators. With over 750 staff and 20,000 volunteers that is a huge task, but Dr. Vathiny said “we can do this now because we have a Tree of Hope”. One of her final comments was that Christianity is very rational and makes a lot of sense. Our prayer is that she and many others will continue to search for this hope. Thank you so much for your prayers for us this week. It has been an amazing journey. Day Three was another incredible day; almost overwhelming at times. These are amazing people, but it is unbelievable the gaps in their culture and their understanding of things. They seem to be happy to be exploring new ideas even though every new topic gets deeper and raises more questions in their minds. With each lesson it is evident that they are learning so much and it is so fun to see their joy when a new concept becomes clear. We are getting to the site by 7:30 and not getting back to my room until almost 9 each night so it is exhausting. My first facilitation went really well and I have my second tomorrow. Please continue to pray; teaching is not something that comes naturally to me. The hotel is a lovely building but the air quality is very poor with a strong smell of mold and everyone is getting sick. Bill had to cash it in by noon as he had a very high temperature. I had a meeting a 6:45 this morning with Bernard – the guy from Holland who is responsible for our funding for the proposal that I have been frantically working on for months. He mentioned quite causally that the money for the project has in fact been approved and is available. He was a little surprised to hear that that was news to us. TWR Cary is upgrading their server and I can’t access my twr mail, which is frustrating! This did shorten my day somewhat as I was unable to finalize a meeting for this evening. I am just now watching the miners being rescued in Chile, and it is awesome.